Valley Heights Rail Museum houses a collection of historic railway and tramway locomotives and rolling stock depicting the development of rail transportation in NSW from the 1880s to the 1980s. The majority of the collection is displayed in the oldest remaining steam locomotive Roundhouse in Australia, opened in 1914. 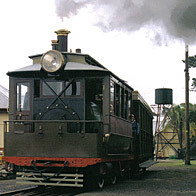 The Museum is the home of both the Valley Heights Locomotive Depot Heritage Museum and the Valley Heights Steam Tramway, operators of the only operating example of the Sydney Steam Tram from the 1880s. School groups have the opportunity to study the history and development of rail transport in NSW from the 1880s to the modern day. Activities include a thorough history of the Locomotive Depot and the development of the Blue Mountains Railway line, and a ride on the Sydney Steam Tram (depends on weather). Facilities include picnic ground and disabled toilet. School excursion information in Department of Education Work Health and Safety Directorate format. I wish to thank you so much for the excellent excursion you prepared and delivered for us at Wycliffe today. Your willingness and effort to look after us and guide us safely to and from the museum was well above the call of duty! Thank you for talking to the kids at their level of understanding. Thank you for your gentleness, fun and for the relaxed and happy atmosphere you provided for us. It is evident that the volunteers and all today are a close and dedicated group of men. You made us feel at home. You made us feel so welcome and special. You treated us like royalty and like we were your very own family. Thank you Keith for dropping down the posters for the children and for rolling/ banding them all together! Andrew and Keith, your communication was wonderful throughout all of the process. I cannot speak too highly of your commitment to us and the excursion you organised. Thank you for going the extra mile! Please send the invoice and we will transfer the money for you at the Valley Heights Locomotive Depot Heritage Museum. Thanks again. May God richly bless you and your work. Page Updated: Sunday, 08-Apr-2018 20:56:14 AEST.